Marina Warner’s soaring new story collection Fly Away Home echoes with the author’s signature concerns about life’s mysteries, wonders and perplexities through myth, history and the present. Beginning with a tale you can read on these pages, I ask her about the gathering of these stories and their wider themes. MR: A version of the story ‘Sing For Me’ was first written for broadcast on Radio 4’s From Fact to Fiction in 2010, in response to the publication of the Saville Report into the Bloody Sunday shootings and an inquiry into an Israeli raid on a Gaza aid flotilla. What made you want to revisit it for this collection, and in what ways did you adapt it for the page? From Fact to Fiction tells the writer on Monday what the week’s potential major news stories might be for broadcasting on Friday, I think. So the stories are necessarily written at top speed. I wrote it originally as a mini radio play, partly because I like that feature of radio, that the characters can be speaking from different times and places, and actors can give great energy to the parts. But when I read it on the page, it seemed underdeveloped, and I decided to give it more coherence by slanting it all through the mother, and make it a story of her coming to a new awareness through her daughter. This gave me a way of translating the stigmatised figure of Herodias from the Bible, as well as Salome herself. How quickly did you write the original, and how long did you spend revising it? Difficult to say how long I spent revising it – I worked on the collection as a whole and came back to the stories more than once. In borrowing from the story of Salome, Maia becomes a figure of youthful innocence, principled reason, rebellion and unbridled retribution. Why are you so drawn to the old stories to help make sense of the present? As a feminist nurtured in the Sixties and Seventies, I believe that we are handed old scripts, but can enter them and take up occupation of them and change them around. Salome, who’s a figure of female wickedness and seduction, offered herself as a subject I could turn upside down. Also, I have always wondered what it must be like to be the child – and especially the daughter – of a tyrant, camp commandant, or indicted murderer, and I’ve noticed now and then reports of suicides: Mladić’s daughter killed herself, I think, as did Svetlana Stalin. I wanted to invert that despair into courage. In your experience, is today’s youth more or less militant, more or less informed than previous generations? The election of Jeremy Corbyn as the new Labour leader shows that the apathy over politics, so often assumed during the last decades, is now over and a lot of new interest among the young has made that difference. New times are beginning, when well-argued opposition to government decisions will have a braking effect. Or so I hope. The newly motivated younger voters are crucial to this dynamic – and this potential. One of the points of education is to give us ways of reading, grasping and analysing material that is put before us in whatever medium. One of the chief problems with the government’s current emphasis on vocational training rather than broader Humanities degrees, is that a degree in business studies or financial mathematics does not foster the interpretive faculties, whereas tragedies, novels, poetry, art, encountered through disciplines such as Modern Languages or Psychology, can build a rich picture of experience that provides context for understanding in other circumstances. What are the limits of government drives for truth and reconciliation, full and frank disclosure? The Truth and Reconciliation Commission in South Africa amnestied everyone who gave evidence in order to encourage full disclosure, and it was a brave and immensely merciful decision of Tutu and Mandela to operate in this way. But it remains controversial, as many criminal acts went unpunished. I wasn’t imagining amnesty was the case in ‘Sing For Me’ – the Captain Procurator in my story is on his way to The Hague for trial for war crimes. One day I will write another story or perhaps more than one about people embroiled in such matters. I think there is a case for a statute of limitations in some crimes, and I think amnesty gives a way forward after national traumas. Is fiction or truth more powerful as an agent of change? It’s not either/or. But truth telling needs to happen in a way that engages the attention of listeners, readers, viewers, and this requires someone to be acting on the audience’s behalf, imaginatively or historically or both together. Primo Levi is a brilliant storyteller and his account of Auschwitz an extraordinary act of witness. But it is a piece of luminous literary writing, too, a crafted, unique narrative work of literature. Fly Away Home collects stories from 2003 to 2015. How many other stories did you write in this period, and what became the criteria for selection? Nicholas Royle, the fiction editor at Salt, read the lot and I followed his advice about what to leave out. I can’t tell: some of the stories he says he likes best are the ones I had most doubts about. A collection needs an overall rhythm, and he wanted, for example, to keep in very short tales, which seemed a little slight standing on their own, but helped frame their neighbours in the sequence, as well as set the themes that thread through the stories. There were five or six more. Which other contemporary authors are doing interesting things with myths and fairy tales? It’s become a very rich strand, in drama above all: Rachel Cusk has just ‘versioned’ Medea at the Almeida, and Anne Washburn has ‘transadapted’ Iphigenia, in a very powerful drama for the Classic Stage Company in New York. But in fiction and short stories, Ursula Le Guin’s last novel Lavinia is a brilliant revisiting and continuation of the Aeneid. There’s also Kathryn Davies in the US, Heather O’Neill in Canada, and many marvellous poets – Robin Robertson, Clare Pollard, Anne Carson. Canongate published a whole series of reworked myths, including a complex novel, Baba Yaga Laid an Egg, by Dubravka Ugrešić, Jeanette Winterson’s Weight, and Ali Smith’s Girl Meets Boy. Michele Roberts, like Angela Carter and Emma Tennant, mined fairy tales for their secrets in the Seventies. What were the highlights (and lowlights, if any) of chairing the judging on the 2015 Man Booker International Prize? Discovering so many writers I hadn’t known before – César Aira, Alain Mabanckou, Fanny Howe, among those who made it to the short list. Reading many more books by writers I have long admired: Alan Garner, Ursula Le Guin, Wilson Harris – even though they didn’t make it. László Krasznahorkai, who was the winner, is a truly revelatory writer, capable of merciless humour and stunning metaphysical vision. Low points: having to choose one from so many, and to put the writers through that long wait at the prize-giving. I think the result should be told ahead of time, and then it’s up to the shortlisted writers if they want to come too or not. I am still working on the novel I began when I finished my last one, The Leto Bundle, back in 2000. It’s inspired by my parents’ lives in Egypt after WWII. I have written quite a lot of it, but life keeps breaking in, as Virginia Woolf, writes, and stopping me. 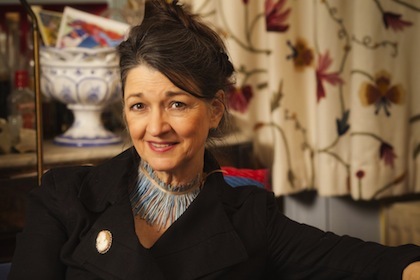 Marina Warner is a novelist, story writer, historian and mythographer whose work examines links between feminism, human nature and the supernatural. She is currently Professor of English and Creative Writing at Birkbeck, University of London. 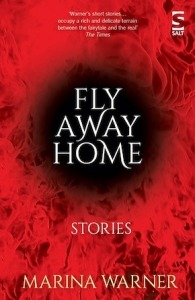 Her new story collection Fly Away Home is published by Salt in paperback and eBook. Read more. Read the story ‘Sing For Me’ from Fly Away Home.